What a mess of a post that last one was! I know you certainly don’t read this blog for the sake of correct grammer and good spelling, but I hope to entice you back by good photography at least. I even missed the mark on that for the last post. Whilst I figure out the technological ins and outs of posting iphone photos, let me try to lure you back with something I do know quite a bit about, knitting. The wee one has been benefiting a lot from my knitting lately. The past few months everything that has been wrapped around my needles has been intended for her. It’s hard not to knit for little ones. You don’t need much yarn, they aren’t yet that particular about the way they dress and all the pint sized knitting patterns are so adorable, it takes great effort not to try them out. 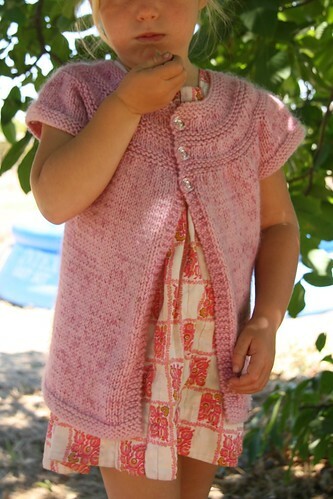 A few years ago I tried knitting a Baby Surprise Jacket for an expecting cousin. 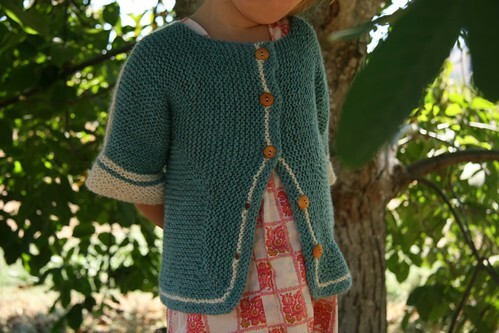 If you aren’t as deeply delved into the knitting world, Elizabeth Zimmerman’s Baby Surprise Jacket is a bit of a legend. It’s a lesson in trust. Unlike today’s modern knitting patterns with lots of pictures and very detailed information, this pattern, as it’s displayed in her book, is a photocopy of a typewritten newsletter. Very bare bones in instruction, you have to place great trust in the few words she wrote. And the dear thing knits out to become the strangest looking piece of knit wear you’ve ever seen. Then carefully, after you’ve finished, she gives a general hint of how to fold this bit of wool origami, stitch together two seams and wha-la, you have a sweater. It’s a bit of a miracle if you ask me. The sweater as instructed is for newborns to one year olds approximately. But one inventive lady figured out how to make it toddler sized and so I followed her lead. My ravelry notes. Then the wee one asked for a pink sweater. A cotton candy pink sweater. Uhg. I think the color pink is very nice, but in small doses. I mail ordered this yarn and it turned out much too pink for me to bear, so I held it double with a purple silk/mohair blend and it became much more tolerable. I love this In Threes pattern. I’d never made a short sleeved sweater before, but I’m glad I did it. 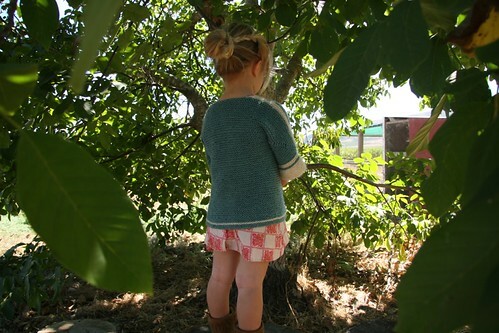 It will keep her little core warm while leaving her busy arms to move freely in her classroom and outside. The last, the Ice Cream Sundae, was inspired by Soulemama’s version and a trip to my favorite yarn store, which had just the right colors for it. In the end, I don’t know that it’s my favorite sweater, but with vintage sparkly buttons, my little girl feels very special wearing it, which is all that counts. 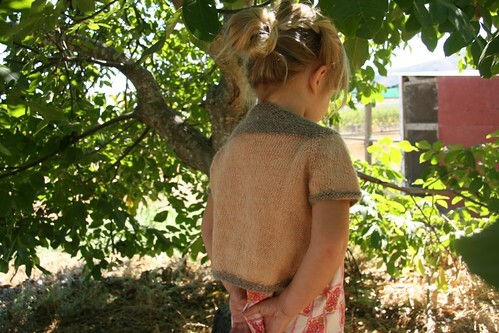 And look here, another short sleeved sweater for her to add to the closet. Now on my needles is a rusty fall colored yarn that I’ve been waiting for autumn to knit with. 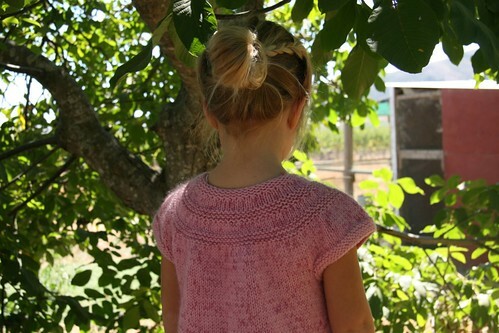 Perfectly timed with Taproot‘s newest issue with a barn sweater knitting pattern. Thank you Taproot! And this one, it’s all for me! Very good timing. I just became a great aunt for the first time and have been looking out for new knits. I wonder if I will be able to tackle the Baby Surprise! Thanks for this post. As always, well enjoyed by me. Lisa, I bet you can tackle it. Thanks to ravelry it’s easy to find help and hints if you need it. Let me know how it goes! You are so sweet Jennifer! Thank you! 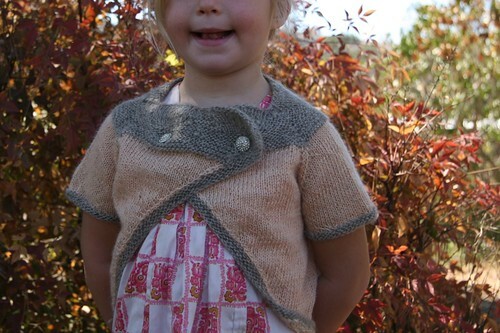 beautiful, beautiful work…oh how I wish I knew how to knit! Too cute! And, the sweaters are adorable. Very cute sweaters! I don’t knit, but have friends who do…will pass this piece on. So beautiful and amazing to someone who has never learned to knit.